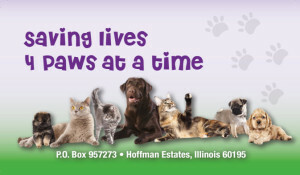 Home At Last is a licensed, 501(c)(3) non-profit, all-volunteer organization dedicated to rescuing animals that are in kill shelters and also stray and abandoned animals in the Northwest Suburbs. We do not have a shelter. All of our animals are placed and cared for in licensed foster homes until their forever homes are found. Home At Last does not take owner surrenders. Please call your local police department, or animal control, for information on stray animals in your area. The results of placing an animal in a foster home vs. leaving them in a cage is enormous as it is important that people can select a new companion in an environment where the true personality of the animal is visible! You can rest assure that any companion animal adopted from Home At Last has had the individualized love of a foster home. This attention to detail is important, so when you adopt from us, it will be a good match for your home allowing them to become a lifelong family member. It is a sad fact that many people don’t have their animals spayed or neutered. There are literally hundreds of unwanted animals out there who are abandoned or lost each year who need a temporary place to stay. These animals need a special person where their confidence and self-esteem can be rekindled and they can feel loved again.